Listening to Tony Bennett’s “I left my heart in San Francisco," I can’t help but think of the many ways that the City has been such a big part of my personal and work life. Growing up in the Bay Area, my father would take us to visit the Golden Gate Bridge. At one of the many tourist landmarks—a massive cross-section of the cable that suspends the bridge—my father would photograph us. Only two of these huge cables hold the entire weight of the middle section of the bridge, containing 80,000 miles of wire steel strands, enough to encircle the equator three times. We posed and we climbed on the cable. Later, as a student at Berkeley, I would take pause at the base of the Campanile and look west at a majestic, unobstructed view of the Golden Gate Bridge. Standing there as a young college student during the early 90s, with no phone to distract me, no updates to post, no texts chirping for reply, I would remember my field trips to the bridge with my father, excited and happy, staring out at the seemingly limitless Pacific Ocean. After college, I lived eight years in San Francisco, working downtown, finding my way through the business side of fashion. The start of my professional career was exciting, if not exhausting, and I immersed myself in the day-to-day rhythm of the vibrant city. With no WAZE to tell me which buses broke down or if BART was delayed, no self-correcting maps to guide me, I set off each day without distraction, allowing anticipation and spontaneity to ride along with me. As in most big cities, there were a number of options to get to work in the morning; mine were BART, the 28 bus or the J-Church trolley. A combination of these, and my feet, carried me to and from, beyond the destinations I planned. Unlike when I was a child, I stayed away from the touristy places. Limited street parking made finding a spot a lesson in frustration, so I left the car at home and explored the city on foot. Climbing and descending the dramatic cityscapes, losing myself in the dense green of Golden Gate Park, meandering in the Mission on warm nights with my new family, life in the city took on new dimensions. Although I stayed clear of Fisherman's Wharf and Ghirardelli Square, I will admit that, as a young mother, I would take my sons to the south end of the Bridge and watch as they balanced and played on the massive cable. In 1999, I relocated to Petaluma and joined Keysight Technologies, formerly Agilent. Immediately I loved my new career with Keysight, and welcomed the many opportunities to connect with both colleagues and customers. 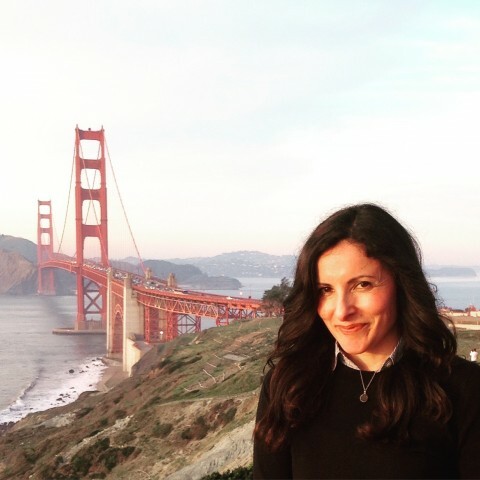 Although my life was rich with work and family, I soon realized that, during my eight years in the city, I had taken San Francisco for granted. Petaluma is beautiful, charmed, with a historic downtown and filled with dear friends. But deep down, I knew that a part of my heart was left in the City. 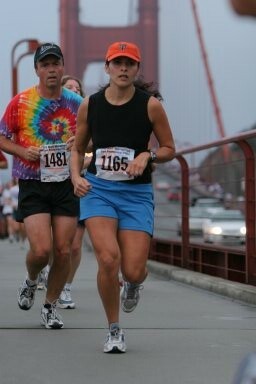 Later, I discovered San Francisco in an entirely new way while running my first half marathon in the City. Nothing compares to a run across the Golden Gate Bridge on a foggy morning, with the fog horns bellowing from below. At each mile marker, there was a volunteer yelling out the time. I didn’t have a Garmin or an Apple Watch to tell me how fast or how slow I was going, or to measure the beating of my own heart. I just wanted to finish, to experience crossing the line at the 13.1 mile marker. I didn’t listen to music, I listened to my breathing, my footsteps. I listened to other runners around me. Sometimes we would engage in chatting, sometimes they passed me, sometimes I passed them. We wished one another well. Since that first competitive run, I have crossed the bridge countless times, during training runs and marathons, and every time I feel the pavement change, from solid to suspended, something awakens in me. It seems I am heading home. Now, when I run a race, smart phones and wearable technology can track my steps, my heart rate, my movement. Pace and mile are announced, and the cloud beams data about how well (or off-track) my race goals are, in real time. Yes, technology is great, but I find that it is the genuine connection with the people around me who help me get to the finish line. Other runners, spectators, friends or family along the sidewalks with noise makers and signs... A simple “you can do it!” has pushed me towards the finish line. It has been 10 years since IMS has come to San Francisco, and this year the event theme is “Gateway to a Wireless Future." The theme for IMS2006 was "Bridge to the Future." The Gate and the Bridge... images that make sense to me. We have come so far as an industry over the last ten years. I can’t wait to hear the Keynote address at IMS2016 by Dr. Martin Cooper, the creator of the modern day smart phone. As his abstract states, “Collaboration is key for wireless technology to improve itself.” At IMS, you will find so many new and existing partners with whom to converse and connect. Typically, I treat trade shows like marathons—the Welcome Reception is the start line and yes, one starts fast, because everyone else does. This year I plan to go slow and steady, taking in the scenery, considering every moment an opportunity to say "thank you for working with Keysight." Enjoy each mile and try to minimize the distractions of devices and deadlines, while remembering what is really important. While you are at the show, reach out to a new person, whether it’s during the technical papers, at the MicroApps or on the Exhibitor floor. And make sure you refuel with snacks and Wine with Steve Cripps. IMS2016 waits for you. Come join us in San Francisco. The City may call to you, as it has always called to me.